Taking a look at the construction materials, used in the building of these dwellings, we should gladly notice the increasing popularity of the German-made 15 or 30 cm red bricks, that allow mechanized application of gypsum plaster; 150 or 200 cement quality class; good exterior 4 or 5 cm polyurethane façade thermal insulation boards; ETALBOND-type aluminum façade panels, natural stone facing slabs of local or European origin; multi-chamber PVC window framing, double glazed window with tinted glass in a range of colours; polished aluminum tubing and connections or stainless steel tubes for outdoor and indoor railings and outdoor railings for terraces and balconies; high quality and Bulgarian and Spanish tiles and granitogres, sanitary ware and mixer taps, both regular ad designer series; high quality interior and exterior doors with natural facing; high class laminate parquet; natural plank wood flooring or classic oak patterned parquet; interior paint finishes – mainly durable innocuous water-based paints; water supply and sewerage mains of polypropylene pipes and connections; autonomous electric- and water-meters ; contemporary electric units with safety fuses and switches . Looking at the new construction private homes in Bulgaria, it may be remarked that this kind of building is mostly concentrated in new complexes of closed type, located either within close distance to a populated area, within the boundaries of small towns or villages, near the sea or the beach, as well as in the villa areas of district centres such as the cities of Varna and Burgas. In terms of construction, the houses are monolithic, brick-built, two-storey buildings: as a rule, there are a spacious living room with a kitchen and some auxiliary rooms on the first floor and bedrooms on the second. Oftentimes, the second floor could be described as attic because of the type of the roof. The roof itself is either classic type of wooden beams with hydro insulation, ceramic or bitumen tiles, or a contemporary “flat” type with thermal and hydro insulation and finishing exterior bituminous membrane. Exterior 4-5 cm façade thermal insulation using a silicate plaster and paint. It is common to see houses with a stone base up to the level of the basement premises and garages. Furthermore, if houses are built in the style of the Bulgarian national revival, their particular features are the oriel and the partial or complete wooden planking of the second and third floors. Frequently the roof of these houses is deliberately made of old Turkish-style tiles and the windows are double-glazed of stained glass or with window grating, in order to thereby invariably stick to the intended ancient style of the buildings. A quite common feature are also the working fireplaces in both modern and traditional natural stone style. The interior walls and ceilings are mostly plasterboard finished with mineral wool quilt provided for insulation. More often in the practice the walls and ceilings are finished with smooth gypsum joint-filling and high quality paint or with decorative plaster finish. The sanitary premises are fully finished and fitted, including room tiling, lighting, an electric water-heating boiler, equipped with sanitary ware, mixer taps, showers and shower cabins. As the newest standard in construction we can define the use of multi-chamber PVC window frames available in various finishes imitating wood or simply in white colour; a regular double glazing or stained glass double glazing in a few base colours; also the installation of high quality interior and exterior doors with natural facing, modern locks and hardware; the floorings are made of high class laminate parquet; natural plank wood flooring or classic oak patterned parquet; the water supply and sewerage mains is made of polypropylene pipes and connections, autonomous electric- and water-meters ; contemporary electric units with safety fuses and switches. The equipment of the home with the most necessary communications, such as telephone, internet and television is a must. The installation of electric plugs, switches and lights on the walls and the ceilings is also obligatory. Often the properties allow having an original and impressive landscaping: a lawn and decorative trees, free-growing flower compositions, decorative blooming bushes etc. Nowadays, the Bulgarian real estate market is in a sufficiently balanced condition. There are a stable interest and demand, and on the other hand sufficient supply on behalf of local and foreign investors to meet this demand. The price increase is moderate, without sharp jumps, as the indications show about 50% annually; in other words except well-balanced, the real estate market is in a stable growth period. The sudden price jumps, the stagnation, the lack of new construction and the lack of demand remain in the times past. As a matter of fact, the demand has always been there, but it used to be either avalanche-like or it was turning into a small flow and therefore usually the buyers could not find that what they were looking for. Things are different now. There are many sites, available in varied price ranges, at different distance from the sea, which in itself influences the prices. On the market the sites differ by their area and planning. To a great extent the variety refers to the apartments and the apartment complexes. The private houses are also widely represented on the market, however, the difference in the house demand compared to the apartment demand, is that no foreigner would buy an old-construction apartment, but the demand of old houses is as stable as the demand of new houses. Of great interest are the areas located within close proximity of the sea - in Bulgaria the length of the coastline is approximately 240 km. The resource is vast; a lot of the attractive plots with a varied-size area, available especially in such regions, are suitable not only for high-rise construction, but also for building of private houses and villas with a magnificent sea view and scenery. Land properties are wanted as in the vicinities of the large seaside cities, such as Varna and Burgas, as in the area of the summer sea resorts, such as Golden Sands, Albena, St. Constantine and Elena, Sunny Beach. As a general rule, the most preferred ones are the localities where the infrastructure is already developed. Here is an interesting fact: if earlier the resort apartments were mostly bought for the purpose of seasonal living, thus more often now, the owners stay living in Bulgaria all year round, go on sight-seeing journeys all over the country, including to the uppermost west regions, to enjoy the natural resources and the variety of resorts. The customer service enhancement in the apartment complexes and the resorts in the country has proven its positive effect on the buyers’ choice. All sites are provided with all-year-round maintenance and security guarding, restaurants and shops, indoor and outdoor swimming pools, gyms, bars, etc. Also very perceivable is the construction quality improvement, all the more that Bulgaria joined the European Union and it does its utmost to build as good as the rest of the European countries. For instance, there are more often sites with autonomous or central systems for heating and cooling of the interior premises. Due to the mass and progressively increasing competition in the sphere of construction, the building companies are frequently urged to bring in their tough business progressive technologies, materials, engineering systems and facilities, in order to ensure better habitability standards for the residential sites and to innovatively bring to life the latest scientific and technological achievements in the field of construction, production of building materials, and last but not least, to befittingly make use of the marketing and advertising art. Also a significant trump for them is the necessity of supply of such sites on the real estate market in the same price range as of the sites not particularly innovative as regards finishing. An example could be the sites that are being built in the quite popular residential area in Varna, called Breeze. Both buildings – with high quality interior and exterior finish, where the apartments are of the same price range, but in one of the sites every apartment is planned to be equipped with the newest autonomous system for heating and cooling of the premises by Daikin, a Japanese manufacturer, and in the second building – the apartments will be heated by regular converter air-conditioners, that is to say the market prices of the apartments are the same, but the level of their technical equipment is different. There are many examples as this one. If we give consideration to the sites that enjoy the highest popularity among newly arrived buyers, the leading positions are taken by those complexes and small apartment buildings, which are located in the prestigious panoramic areas of Varna – Bulgaria’s sea capital, in regions such as Breeze, St. Constantine and Elena (sea & spa resort in the vicinities of the city), Primorski Park, Galata. The apartments in these areas are suitable as for a seasonal summer vacation, as for all year round living and business. Moreover, there still is a quite good demand for not too expensive complexes in the small resort towns, such as Kranevo, Byala, Nessebar – with pure nature and moderate resort activity. The rise in popularity of the big summer resorts, such as Albena, Golden Sands, St. Constantine and Elena, Sunny Beach - famous across Europe – and the apartment complexes located on their territory continues, all the more that the customer service standard in the country’s resorts gets continuously improved and gradually meets the requirements for a European-level service. We believe that this investment potentiality should be seen not in the way, presented by many investment and consulting agencies. They all together appeal to buy apartments in complexes in order to resell them in the nearest future. Those who have got big financial opportunities are suggested to build these immense apartment complexes. This statement is true to a certain extent. In recent years Bulgarian sea-side has been attacked by a huge number of such apartment complexes. They offer us the first line but in fact it’s the twenty first. Of course you can sell your apartment in the future but in this case we can’t speak about big profit. At the end it turns out that it’s not an investment at all. It’ just one failure project. There’s one more problem that exists with apartment complexes. They’re getting old really fast. The quality of building is not very high. The complex is built within one really short period in order to sell it as fast as possible. But it’s getting hard to sell it and the reason is the abundance of apartments. Let’s say there’s one apartment complex consisting of 50 flats. Out of 50 flats only 5-6 have been sold. When the building of the complex began there was nothing in front of it and now it’s hidden by another big complex which quality is much better and the apartments are sold with same price and even less. Of course, you get frustrated. If a complex is located on the first line or very close to the beach (it’s forbidden to build on the beach since it is government property) or the location of one complex can be on a hill, raised above the sea line. You have also to check the regulation plan, density of building, etc. You should keep in mind that if the plot is regulated, then you are allowed to build on it and you should know the percent of the territory and the number of levels that are allowed. If a plot is not regulated but is located in a very attractive place and you are dying to buy it and start building you should also keep in mind that any building is forbidden here just for geological or ecological reasons. There’s a draft law that prohibits any building in 100-200 m from the sea-line. This project has not been approved yet. If it is approved, it won’t cover territories with an approved regulation plan or those territories which are in the process of changing their status. Even in this case you have to ask from the sellers for official documents on plots you’re going to purchase. The design of a building and the apartments plan should also be on a high level. The process of selling apartments in such complexes may last for more than one year. If an apartment is already furnished you must not be stingy in buying furniture of a better quality than that which is in your new “furnished” flat. Furniture is not so expensive now compared to a price of your apartment. That is why you should not be scared of the fact of what will you do with all this “luxury furniture”. 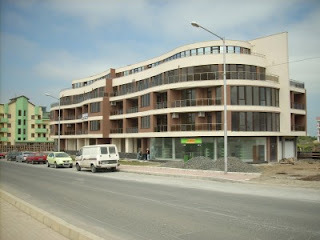 At the moment there are many offers of entirely furnished apartments sold for 500 Euro per sq.m. Some years ago same apartments were sold for 1 200 Euro per sq.m. Forming of a price requires professional and careful approach. First of all, you have to find an optimum in the building process. It also requires big experience. The expenses on finishing materials and the stability of the whole building construction also depend on foundation and concreting of one building. Thus you have to be very attentive in choosing a project or a building company. Your expenses on your first building can be 2 and even 3 times more than you have expected. But if you work with a professional team you can avoid these problems. In case of a low basic cost which is formed not at the expenses of the quality of construction, you can easily modify the prices following market movement or in case of a wholesale discount. The complex has to have a zest. It can be some architectural element or design of a landscape. There should be one professional approach in design work, fulfilled on a high level. It should also be reflected in the complex name. All these brightly colored apartment complexes with pompous names can not be recognized in two years. Plaster starts to fall off the walls and the building acquires shabby look. You can only feel sorry for that. What is strange about this situation is that relatively cheap apartment complexes (500 -800 Euro per sq.m) are sold but not so actively. Apartments offered with high prices (1 500 – 2 200 Euro per sq.m) do not correspond to their quality and the demand is quite low. Unfortunately really luxury apartment complexes are quite few and the demand for them is obvious. A resort location has got many advantages like communications, stocks for building materials, etc. There are disadvantages as well. In recent years the Sunny Beach and the Golden Sands have become over packed with newly built apartment complexes and hotels which just ruined the general look of these resorts. You can hardly call them vocational places. The Sunny Beach officially gets the status of a “city” – city which fades in winter time. In the Golden Sands the situation is the same - one big never ending construction. You can only imagine poor tourists jumping through mud and dust. You will certainly ask: “What all these people are doing here?” The answer is quite simple. All these people are just trying to reach their apartments which in the nearest past were located on the fist line and now only God knows what line it is, because in front of their complex there’s another building which is much bigger and hides when ever existed sea panorama. The situation like this reflects the sales. Spain also underwent such problems. You will ask “What has to be done then if there are no spaces to build?” There are plenty of plots in other regions which have already got a building status or just in the process of receiving it. The land costs about 100-200 Euro which is quite a good price for the first line. Bulgaria has got a big capacity to build about 5-7 big resorts. There are kilometers of a beach line with road attachment and other communications like in Kamchia, Shkorpilovci, Chernomorec, Byala. These are not the projects for the future. This future has already begun. The potentiality for investments is huge. There is one more interesting project for investment which has not been so much popularized in Bulgaria like in Russia. We are talking about Town House. In Bulgaria it usually consists of 2-10 houses, sometimes with a common swimming pool. The area of one house is about 120-200 sq.m. It doesn’t look serious compared to a town house with an area in several hectares with a common 24-hour security. In Moscow such town houses became very popular. The need in such settlements is obvious, since not everybody wants to live in an apartment. Traditional neighborhoods for building villas in Varna “Trakata”, “Euxinograd” do not really satisfy the buyers who are looking to purchase a house for 200 000 -500 000 Euro, First of all because of the quality and the plan of the offered villas and second, the neighboring houses do not look very attractive. There are plenty of offers with different range in prices. The thing is that one apartment is getting old within 2-3 year period and 10-15 year old house will not be interesting at all for an exacting buyer with money, since he will need a house surrounded by same luxury villas. In Sophia properties are much more interesting in architectural way and even the prices are more attractive. For example, Dragalevci can be hardly called a luxury complex. The whole complex plan and the security are not well provided. Besides, on the way leading to Sophia, you have to pass through shabby dusty roads with a usual traffic jam. We believe that new modern town houses need to be built in the vicinity of every big Bulgarian city. Lands are most attractive type of property in Bulgaria. The accent in selling lands is oriented to more interesting regions. Earlier there was a great demand in agricultural lands since they were very cheap and in big amount. Now it’s getting a little hard to change land status. That is why investors are more interested in panoramic plots or plots located in resort areas where there is approved plan for the territory development and where there won’t be any problems with the changing of land status. There is still an interest in buying agricultural land but it’s mostly used for the agricultural purpose. Time passes by and building technologies even slowly continue to develop. Building companies pay more attention to the quality of building materials and to better architectural solutions, because the competition requires that. Buyers themselves become more and more demanding. One can install just a hole for air conditioning and others install an air conditioning system for the whole building. The selling price remains the same. You can finish a porter with terracotta flooring or you can do it with granitogress and put painted banisters. Or you can use marble and granite and use plaster for walls from Akzo nobel. Your client will note that and will choose your building. There is plenty of wood and natural stone in Bulgaria. Natural materials have always been in favor.